Third grade recently hosted their second annual wax museum! 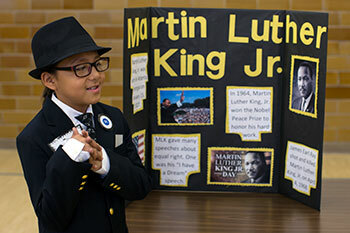 Some of the historical figures represented were Helen Keller, Amelia Earhart, Martin Luther King, Jr., Sacagawea, George Washington, and Benjamin Franklin. This activity helped students to learn about people from history and the impact they made, as well as skills like reading, writing, speaking, researching, and typing. The students began studying biographies in their reading class. They first studied the life of Ruby Bridges, learning about her journey as one of the first African American students to integrate into a white school. The students then began studying short biographies of other famous Americans such as Neil Armstrong, Betsy Ross, and John Chapman. They answered basic questions about each of these famous people such as when and where they were born, why they were famous, when and where they died, as well as any other interesting information. This helped the students when it came to researching their famous person for the wax museum. Students had to find pictures and type out four facts to share on their display board for the wax museum. After studying biographies, it was time for the students to pick their famous person for the wax museum. We had some choices for them to pick from, but students were free to pick who they wanted to research and portray. After selecting their famous person, students began the research process. They used a graphic organizer to help organize their research. Students were required to answer the same basic questions from before. Once students had their information, they were able to write their speeches. Another aspect of this project was finding pictures and typing up some of their facts to put on their display board for the wax museum. The final step was putting the boards together. The students arranged letters to spell the name of their famous person, pictures, and the facts to fit nicely on their display boards. Students practiced their speeches any chance they had to memorize it, and also picked out costumes to wear the day of the wax museum. Emilia recites her speech as Sacagewea for visitors to the wax museum. On the day of the wax museum, the students dressed in character and stood frozen awaiting visitors. They came to life after someone pushed their talk button. The students would give their speech, refreeze, and await the next person to push their talk button. 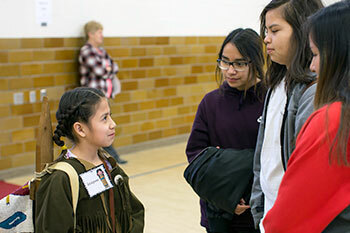 Students and staff from all over campus were invited to come by and learn about some famous people from history. The students did an excellent job researching their famous person, as well as writing and memorizing their speeches. This process has been a highlight of the year for the students. They love being able to share information they are learning with others! I wish I could have been there to go listen to all the kids. I teach this age piano lessons and I love how quickly they learn and absorb knowledge! Great job, kids! I hope you keep this tradition of learning alive at St. Joseph’s for years to come! Wow!! Amazing! Wish I could have been there! God bless all the children and all the teachers at St. Joseph’s! I am a teacher also, and I know the wonderful and rewarding feeling you get when you see your students succeed! Fun and fantastic learning experience. Way to go teachers and students! I wish more public schools would do something like this. What a GREAT research & learning project – including art, costume design, public speaking, etc., etc. ! I wish that I could have been there to see all of the displays and to hear everyone talking about their favorite characters. CONGRATULATIONS, EVERYONE ! Thank you for your kind words Gale – the kids worked a long time on each element! That’s great!!! A fun way to learn!! Our grandson here in Houston Texas did this last year at his school!!! Previous Previous post: What a Sport!